The aviation sector is facing headwinds as some airlines grapple to cut costs and others struggle to stay afloat. The first week of September brought into the open the growing chasm in the aviation sector. The government, along with the Airports Authority of India (AAI) and global industry body IATA, organised a mega event in New Delhi's Taj Palace Hotel to celebrate 50 consecutive months of double-digit passenger traffic growth. The participants, led by Aviation Minister Suresh Prabhu, painted a rosy picture of the sector, including India's potential to become the world's third-largest aviation market, flying over a billion passengers a year, and plans to build 100 new airports at an investment of $60 billion in the next 10-15 years. A day before this, global consultancy CAPA came out with a report that highlighted the fault lines in the sector. "Indian airlines are expected to post combined losses of up to $1.9 billion this financial year driven by rising costs and low airfares," it said. CAPA is not the only agency that has predicted heavy losses for the sector. 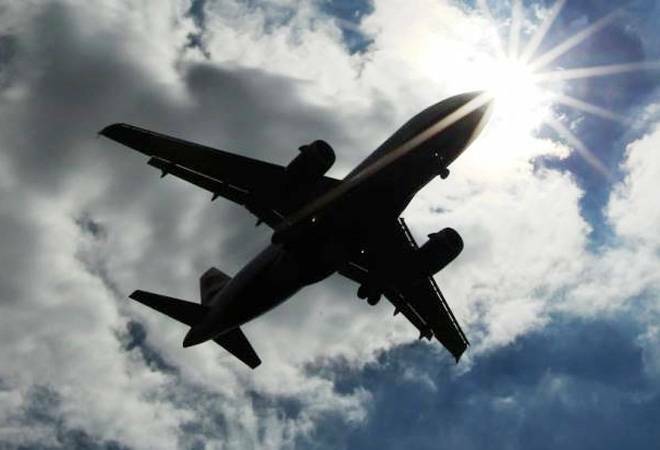 In July, ratings firm ICRA had estimated the 2018/19 aggregate loss of India's aviation sector at Rs3,600 crore, up from Rs2,500 crore in 2017/18. The recent quarterly results of airlines show the rising distress in the sector. Take Jet Airways. The second-largest carrier posted a net loss of Rs1,323 crore in quarter-ended June 2018. 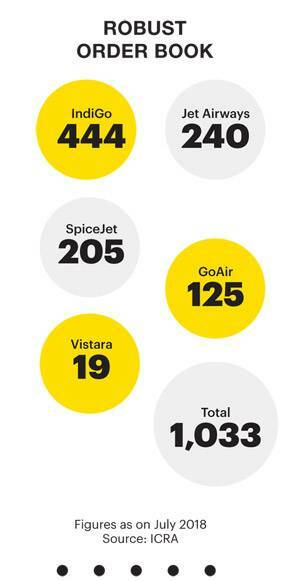 Other major carriers - IndiGo and SpiceJet - registered decline in profitability. 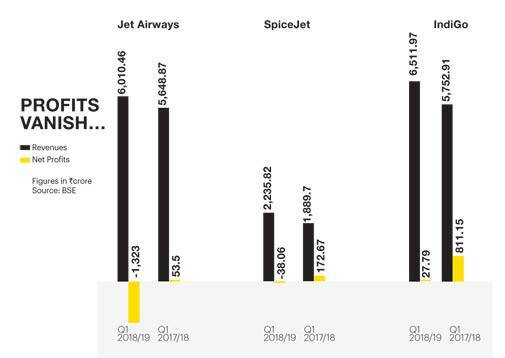 Despite strong growth in domestic passenger traffic over the last four years, rising ATF prices, rupee depreciation and intense competition have weighed heavily on airlines' cost structures. ATF prices have risen 38 per cent from Rs50,200 per kilolitre (KL) in September last year to Rs69,090 per KL in August 2018. Rising fuel prices and depreciating rupee are just one side of the story. Industry insiders blame the ongoing fare war for the sorry state of affairs. Airlines, both low-cost carriers (LCCs) and full-service carriers (FSCs), have not been passing on higher fuel costs to customers in order to match the lowest fares in the market. IndiGo, in its last two analyst calls, pointed out to fares staying at low levels in the 0-15 day booking window. This window generates higher revenue for airlines. The most evident sign of a price war is higher passenger load factors (PLFs) of 85-95 per cent despite high capacity addition in recent times. Since 2016/17, the industry has been adding capacity (available seat kilometres or ASKM) at a fast pace. In 2017/18, the ASKM growth was as high as 15.1 per cent. In a situation where passenger demand is static, higher capacity addition will result in a decline in PLF - seats occupied as a percentage of total. However, this time, higher capacity additions coincided with higher PLFs as airlines chose to keep fares low in order to maintain demand at elevated levels. "Price war has taken a toll. There's hardly any difference between fares of FSCs and LCCs," says Murali Ramachandran, CEO of Turkish ground handling firm Celebi Aviation Holding India. Kinjal Shah, Vice President, ICRA, says that some increase in fares would have supported the profitability of the airlines. "Capacity additions have been high and will continue to remain high. The issue is that India is a price-sensitive market. Despite demand being high, the industry currently lacks the pricing power. Every airline says that they are in stress and this [fare war] is not sustainable but obviously there have to be steps taken to raise airfares. 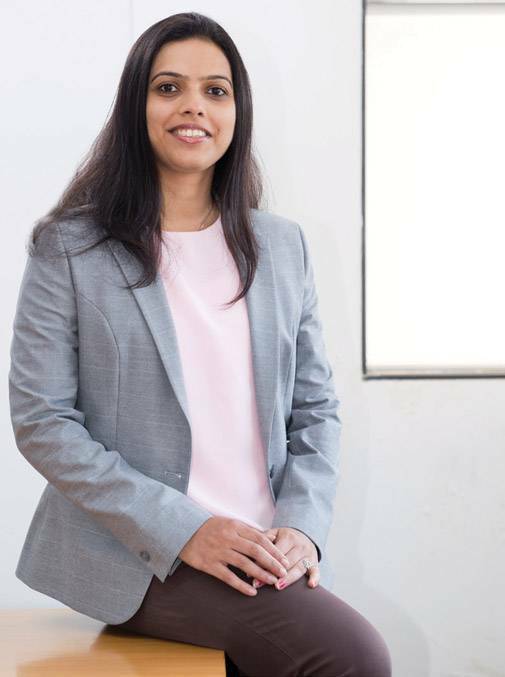 In 2014/15, the industry did witness an increase in ATF prices but the losses were not as huge because the airlines passed on some part of the higher costs to passengers and also the dollar-rupee exchange rate was not as adverse as today," she says. Mark Sutch, Regional Managing Director (South Asia, Middle East and Africa), Hong Kong-based Cathay Pacific, says higher capacity addition is a global phenomenon which is hurting the airline industry. "If you look at order books of manufacturers, the airline industry is witnessing higher capacity additions, which are affecting yields. It's very difficult at the moment, nobody is making money," he says. ICRA estimates sector-wide capacity growth of 15-17 per cent in 2018/19, led by sizeable order backlog of incumbents, fleet expansion by start-up carriers like Vistara and AirAsia India, and additional capacity deployment under the UDAN Scheme. The current fleet of Indian carriers is around 455; orders for about 1,033 aircraft are pending. With crude oil prices hovering around $80 per barrel, and the dollar-rupee exchange rate at 72, passing on higher costs to passengers is not going to help much. The carriers might need to bring down costs by renegotiating contracts, say analysts. Celebi Aviation's Ramachandran says that airlines are in a tough situation as aircraft lease, fuel and engineering-related expenses - the three biggest cost components are all currency-sensitive. "Tough times are ahead, they need to figure out long-term and sustainable ways to contain costs as one of the components (fuel) is never really in their control. Given the current situation of overcapacity and strained yields, if a new airline walks in, one keeps hearing about Qatar Airways plans, there will be a problem for the existing players," he says. "Rising fuel prices are a common cause of concern for airlines across the globe. In a market like India, this becomes even more challenging considering that the cost of doing business is already high. 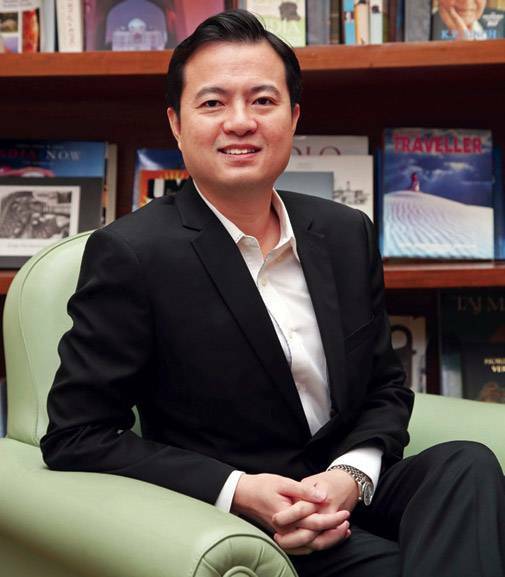 While we remain hopeful of the government's efforts to reduce high taxes and other charges, we are working on making our cost structure even leaner," says Leslie Thng, CEO, Vistara. "The only way to survive in the current environment is to be efficient and keep costs low. We will control costs and work on efficient fleet optimisation. We are also looking to optimise network, improve crew utlilisation and take smart initiatives within the company," says Cornelis Vrieswijk, CEO, GoAir. People are not ruling out the possibility of consolidation if the situation becomes worse. Just after the 2008 crisis, many big airlines in the US merged - including Northwest Airlines with Delta Air Lines and United with Continental Airlines. A lot of them were making losses, so the first thing they did after consolidation was to reduce capacity to keep fares up. "The US has gone from losing money domestically to one of the most profitable markets in the world. You will see a similar pattern in the Indian market. The airlines will potentially merge to manage capacity. If they reduce capacity, it is naturally going to maintain or increase their yields," says Cathay Pacific's Sutch. Though the relatively low penetration, support from the regulatory environment, development of new airports and healthy passenger demand still make India one of the most promising aviation markets in the world, there are strong indicators to suggest that these headwinds are pretty strong.